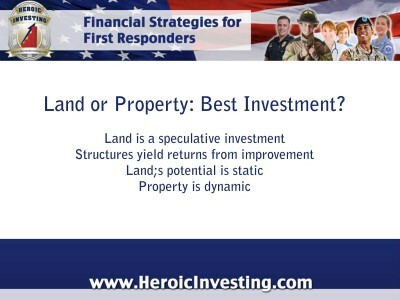 Traditional investing advice has it that investing in land is the wisest choice in real estate. A recent report by the Urban Land Institute states that thanks to an upswing in housing and commercial construction, coupled with rising land prices, buying land is a sound investment. But according to Jason Hartman, land is actually a pretty speculative investment – it’s not the land that offers long term returns on the investment – it’s what’s on the land. One real estate investing strategy is to buy land at low prices and either build new structures on it, which can then be rented or sold, or hold the land against a future time when it can be sold for a higher price. But as Jason Hartman says, that’s precisely why land investment is speculative. Land values may rise in some markets, but the potential for a return on that land depends on other factors. In order to see a return on a land investment, the land must have something to offer that yields a profit over time, and vacant land offers little in the way of ongoing returns on the investment, Rather, this kind of purchase gobbles money in the form of property taxes and any other costs deriving from local and state ordinances. Land values may fluctuate, but it’s the structures on the land which can appreciate and yield income. Investing not just in land, but also in property – which includes land, structures and everything – is a sound strategy that secures a long-term income. Although land is finite and static, improvements – and the potential for improvements – to structures on the property are dynamic.